About an hour-long ferry ride off the northeast coast of Newfoundland, where the frigid waters of the Atlantic Ocean crash onto a jutting granite shoreline, is the tiny island of Fogo – a place so remote that conspiracy theorists believe it to be one of the four corners of the Earth. And in a small village on this island – where wooden houses and clapboard sheds dot the shore like Monopoly pieces – is Kwang Tung Restaurant, Fogo Island's very own Chinese café. I first learned of Kwang Tung after stumbling across it in a food blog post titled " I can't believe there's a Chinese restaurant in Fogo." Like the author, I was bewildered. How did the restaurant wind up there? Why would someone decide to open a Chinese restaurant on Fogo Island? The post included a photo of a plate of food: a deep-fried egg roll, its blistered surface laid atop brown fried rice. There was also a photo of the Kwang Tung menu, an inventory of Chinese-Canadian classics: sweet and sour won tons, moo goo guy pan and a long list of dishes dredged in batter, deep-fried and coated in sweet, sticky, vaguely spicy sauces. "Chinese Canadian food," the writer proclaimed. "Good in that guilty pleasure kind of way." This was "chop suey" cuisine, which is distinct from "authentic" Chinese food. The name "chop suey" translates more or less into "assorted mix," and refers to a repertoire of dishes mostly developed in North America in the mid-20th century. A mix of ideas both East and West and, to my eyes, frozen in time. For my family, and every other Chinese family I knew growing up in Vancouver, food was an obsession. I would listen as relatives argued about which dim sum restaurant's har gow wrapper was the thinnest, or whose xiao long bao the juiciest. Now living in Toronto, I've witnessed first-hand the rapid development of very diverse Chinese cuisines in this city, too. I had assumed the small-town Chinese restaurant was a fading piece of the country's history, a relic of the past. But, at least on Fogo Island, that didn't seem to be the case. I wanted to know more. "They are, in very much a weird way, a Canadian thing," said Lily Cho, a York University professor who has written a book on Chinese restaurants. 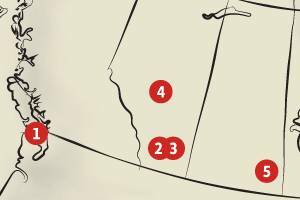 Of course there are Chinese-American restaurants in the United States, but the story up here – from the way the restaurants spread across the country along with the railroad, to the invention of dishes like Alberta ginger beef and Thunder Bay Bon Bon ribs – is uniquely Canadian. These restaurants serve many purposes, said Cho. They create jobs and opportunities for newcomers and they fill a void for the entire community, often providing services and infrastructure that don't otherwise exist. For a century and a half, they have been quintessential small-town Canadian institutions. 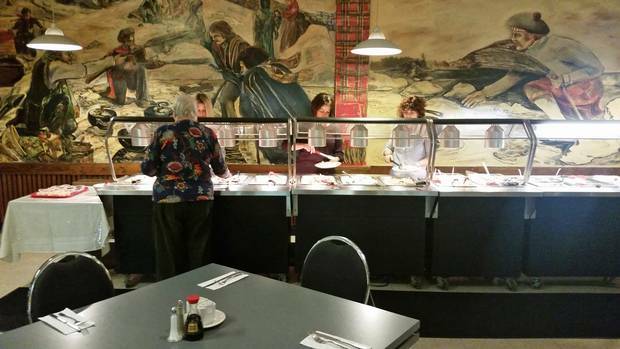 The curling-rink location of Ling Lee’s Chinese Cuisine, with a backdrop of a mural depicting historical figures throwing curling stones, helps make it part of the fabric of the community in Thunder Bay, Ont. And, she said, they aren't disappearing. Newcomers are still arriving in Canada and still moving to small towns to open Chinese restaurants. Just about every town across the country, I learned, has its own Chinese restaurant – according to some estimates, more Chinese restaurants than all fast-food restaurants combined. I had so many questions: Why would these restaurant owners take the gamble to leave everything behind for this new place? Why open a Chinese restaurant, and why in a small town? 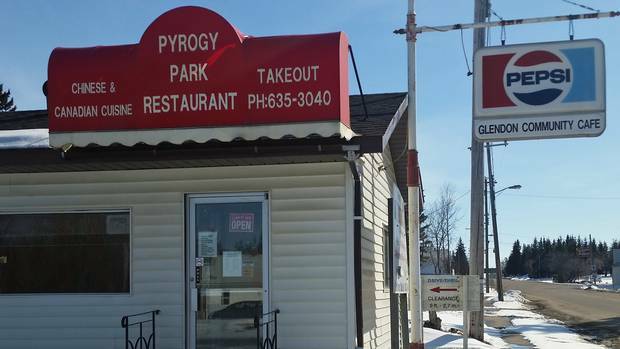 And why does just about every Canadian town have its own Chinese restaurant? I was especially intrigued by Kwang Tung: Fogo Island was probably the most isolated place I could imagine – and one of the least diverse. I scoured the Internet for more information. An image search revealed one last clue. A photographer from Montreal had visited the restaurant a few years ago, capturing an image of a faded white building. Above the door hung a Pepsi sign, with the restaurant's name etched in Charlie Chan-style lettering. This photo of owner Huang Feng Zhu posing in front of Kwang Tung Restaurant in Fogo Island, Nfld., inspired the writer’s journey. In front of the restaurant stood a woman with short black hair. She looked to be in her 50s, dressed simply in a T-shirt, dark slacks and grey sneakers. Her lips curved upwards. According to the caption, her name was Huang Feng Zhu. She ran the restaurant seven days a week, by herself: "She lives upstairs so basically she never leaves." 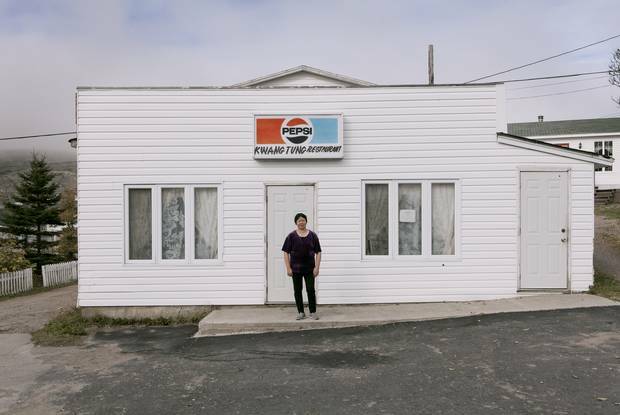 I became determined to find Huang, to understand how she ended up running a Chinese restaurant on Fogo Island. I wanted to know how she wound up there alone. So I set out a plan: to drive across the country, visiting as many small-town Chinese restaurants as possible. I'd start on the West Coast, where the earliest wave of Chinese settlers began arriving in 1858. From there, I would make my way east across a 2 ½ -week period, roughly tracing the path of the railway. The last stop would be Fogo Island, where I hoped to visit Huang at the mysterious Kwang Tung Restaurant. The first Chinese workers arrived on Vancouver Island in the mid-19th century. As they stepped off their ships from their long journey, Victoria was their first glimpse of this new country and their first step in their search for gold. A few decades later, between 1881 and 1885, thousands more would land here, for the promise of $1 a day, working to build the railway. An entire infrastructure sprang up around these men, creating Canada's first Chinatown along a four-block stretch of the city's downtown. Some of them opened cafés and shops where labourers could stock up on supplies, have a meal or spend the night before the final leg of their journey to the Cariboo in search of gold, or to find back-breaking work on the railway that would eventually unify this country. On a grey, rainy morning in mid-March, I flew from Toronto to Victoria, picked up a tiny rental car and drove straight toward this Chinatown. But if I had hoped to gain insight into the experiences of early settlers, I was out of luck. Chinatown's labyrinth of brick buildings and narrow alleyways – once crowded with tenements and brothels – is now the site of coffee shops and office space for tech startups. By the mid-20th century, many of the city's Chinese had moved to Vancouver and across the country, essentially leaving Victoria as a museum, a Chinatown for tourists with street fixtures decorated in red and gold dragons. Only a few hints of the original Chinese remain, like the Chinese public school that was built in 1909 after locals complained that the Chinese children enrolled in regular public schools didn't belong. On the second day of my trip, in Vancouver, I sat with history professor Henry Yu in a cafeteria on the lush green University of British Columbia campus. "Nobody goes halfway around the world on a whim," he said. He explained that before anything else, I'd first have to understand Gold Mountain. Gum san, or Gold Mountain, was the nickname the first Chinese workers – the gold-rush-seekers and the railway builders – gave to this place. Up until the mid-20th century almost all of Canada's Chinese immigrants came from the southern Guangdong province, an area clustered around the Pearl River delta and prone to floods, earthquakes and drought. The vast majority came from the same four poverty-stricken counties: Toisan, Hoyping, Yinping and Sunwui. What these early settlers had in common was a wealthy relative who had gone abroad. Known as the "guests of Gold Mountain," these first adventurers had returned to China with unthinkable luxuries, like Singer sewing machines. They built houses for their families and schools where their children could study. Their younger relatives all heard the same story: that if they left behind their lives in China for Gold Mountain, they, too, could bring back riches. The young men watched their heroes with stars in their eyes, said Yu. "They thought to themselves: 'I want to be that guy. Wherever he went, I want to go." What many people still don't understand, Yu said, is that Gold Mountain wasn't simply a place. The Chinese called the mountains surrounding the Fraser Valley Gold Mountain. But they also called the golden wheat fields of the Prairies and the lush green forests of Northern Ontario Gold Mountain. The United States was Gold Mountain, too. So was Australia. To them, Gold Mountain was the whole idea – a life cycle where young men from poor families could go abroad and strike it rich enough to change their family's destiny. But that required an initial cash investment, which was generally borrowed from a relative who had already made it in Gold Mountain. The loan would normally take a few years to pay off, especially because of anti-Chinese laws that prevented these early immigrants from working in all but a few businesses: laundries, convenience stores or restaurants. Early cafés were Chinese only by virtue of their owners – the menus generally listed Western dishes, like hot turkey sandwiches and fried veal cutlets. Once the loans were paid off, these men were free to set up their own business. To avoid competition, they would often start it in the next town or railway stop over. Slowly and gradually, these restaurants multiplied, appearing first in major cities, and then spreading outward, like spiderwebs. Anywhere the railway stopped – through the Rockies, the Prairies, out east – the restaurants would also travel, until they were all across the country. As I drove around Vancouver, I saw few signs of the original Chinese cafés. Chinese food in the city today reflects the many waves of immigrants that have come since. My own parents moved from Hong Kong and Guangdong to Canada in the 1970s. They weren't alone. After Canada liberalized its immigration policy in the late 1960s, massive numbers of Hong Kongers and Taiwanese came to Vancouver, among them highly skilled, mostly Cantonese-trained chefs. Recently, the Chinese food has gotten even better. Newcomers from all over mainland China have brought with them wealth – as evidenced by gilded seafood restaurants serving $100-a-plate fried rice – and a rich diversity of regional cuisines. Driving past Richmond, the Vancouver suburb where many recent immigrants have settled, I passed crowded strip malls selling everything from mala Sichuanese, Shanghai crab dumplings, to fragrant Hainanese chicken rice. I wondered what this dizzying mix had in common with Huang, her fried egg rolls and her little restaurant in Fogo. At every step, I was putting together more pieces of her puzzle. The name of her restaurant, Kwang Tung, was just another way to spell Guangdong. Canton, Kwang Tung, Guangdong – they all refer to the same southern province from where the Gold Mountain men had originally come. It was likely, I thought, that Huang had already been here for some time. I remembered Yu's last words before he dashed off. "What connects it all is family," he said. Chinese newcomers rarely still refer to this place as Gold Mountain, he said. But their motivation for coming here – and for immigrants from all over the world since – is often still the same: a promise of a better future for the next generation. "The restaurants are just the vehicles. It's all about the families." Pioneering restaurant owner Bing Foon Choy and his wife, Poy Fong Choy. The next leg of my trip was the long drive out of Vancouver and into Alberta. For days, the mountains had gawked down at me, like giants at a parade. Now, as I inched further east, the mountains gave way to massive plains and wide, open road. The sky felt bigger. Bluer. This was where, in the latter half of the 19th century, the Canadian government offered cheap and free land to European, American and eastern Canadian settlers, in an attempt to encourage mass settlement: Promising a better life to those willing to take on a rugged space with harsh climates and long, lonely winters. As I drove, I wondered about these settlers and what they had in common with Huang. I wondered what feelings they all shared about leaving behind their homes to come to this new, hostile place. Was it desperation? Ambition? Hope? In the Prairies, I would find all three. About a 40-minute drive west of Edmonton, beyond the industrial sprawl of the city and amid long stretches of farmland, is the 15,000-person town of Stony Plain, Alta. 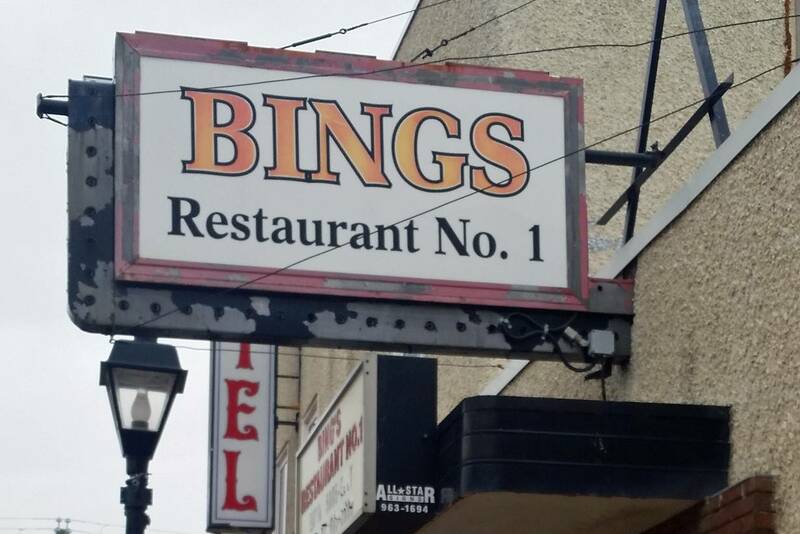 On most weekends, you can find William Choy cooking in the kitchen at Bing's #1 Restaurant. It shouldn't be unusual that Choy works in the kitchen. After all, the mild-mannered, bespectacled 42-year-old owns the restaurant and grew up in it, too. As a child, he watched as his grandfather Bing Choy, who opened the place in 1970, worked in the same crowded kitchen. And by the time his own father Fon Choy took over, Choy himself was old enough to help out – wiping down the red formica tables, topping up cups with coffee, and whatever else needed doing. But what makes it unusual is Choy's part-time job: He's also the mayor of the town. Like most of the Gold Mountain men, Bing Choy left his wife and children behind when he came to Canada in the mid-1960s. That's in part because it was cheaper for the families to stay in China, but also because of restrictions on immigration. To protect jobs for non-Chinese Canadians, the government imposed a head tax in the late 19th century on Chinese entering the country. This was followed in 1923 by the Chinese Immigration Act, which closed off Chinese immigration almost entirely until 1947. This legalized discrimination set the tone for anti-Chinese sentiments across the country – including in cities like Vancouver and Toronto, where Chinese restaurant owners were subject to police harassment, as well as violence and vandalism. It wasn't until 1967 that Chinese were allowed to enter this country based on the same criteria as others. 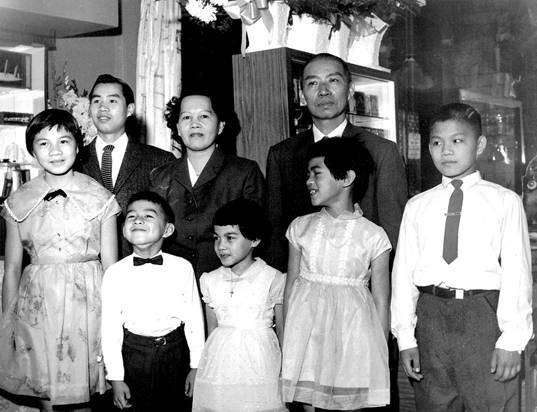 The rest of the Choy family came over in 1980, including six-year-old William, the future mayor. Many of his childhood memories revolve around the restaurant. He raced home from school at midday to help out with the lunch rush, and did his homework in the basement storage room. "Free time" on weekends was spent helping out at the restaurant, too. It was only natural, then, that after graduating university with a teaching degree in an economic downturn, he returned to the restaurant. In 1997, he officially took over, though his parents continue to help out. Choy calls Bing's the "community living room," and driving from town to town showed that it's not alone in serving this purpose. In Vulcan, Alta. – an 1,800-person town decked out in Star Trek paraphernalia – Lin Qin's restaurant, Amy's, is where seniors' groups gather for lunch. And in Grenfell, Sask., Moon's Cafe is owned by 46-year-old recent immigrant Moon Wei who, like Huang in Fogo, runs the restaurant alone. Moon's is where elderly men spend their afternoons, nursing cups of coffee while leafing through newspapers. A few years ago, Linda Tzang, a curator at the Royal Alberta Museum, put together an exhibition on how small-town Chinese restaurants have historically served as Canada's mail-sorting facilities, child-care centres and even fire stations. "It was just whatever they could do to keep their businesses afloat," she said. She even came across one Alberta town where the restaurant was so crucial to the community that when the owners retired, locals recruited a new family from China to take over. Many of Canada's small-town Chinese restaurant owners spoke to me about loneliness, and feeling alienated. But for the Choy family, living in a small town made things easier, he said. Regulars would offer English lessons and other help to his parents. They'd point to their coffee cups as they were drinking, mouthing slowly the words: "Coffee. Cup." "You're not lost in the whole mass of things," Choy said. "They're more willing to give a hand." Choy and his siblings now all have houses and families of their own. "I'm the mayor of the community we grew up in," says Choy. "Things like that couldn't happen in China, right?" Since Choy was first elected in 2012, he has worked both jobs, running back and forth, often pulling off a grease-splattered apron midday to attend a town meeting. "This is my business, where we came from," Choy told me in his kitchen, as he fried a large platter of rice. He covered his wok with a lid, then shuffled out to the dining room. Hanging on the back wall were four black-and-white photographs: pictures of the Guangdong village where Choy was born. Behind him in the kitchen, his mother Jean beamed. I asked if this is what she had imagined for her son. "No," the 65-year-old said in the Toisan dialect. Running for mayor was entirely his idea – entirely outside of her comprehension, and the life she knew growing up in a village in Guangdong. "How could I even have imagined it?" Ms. Choy said, grinning her gap-toothed grin. "How could I have imagined it?" Despite signs to the contrary, this restaurant in Glendon, Alta., is called Thai Woks N’ go. It's not just the Chinese who came looking for Gold Mountain. It's a journey many continue to make today. The past few decades have seen tens of thousands of young men and women – many of them immigrants from Somalia, Jamaica and the Middle East – flock to the Prairie oil sands seeking black gold. Using pumps and shovels to extract the liquid from deep beneath the earth, they hope to fund their own version of a better life, their own Gold Mountain. But just as gold in the Cariboo didn't last, fortunes here have also changed. As common as the sight of oil rigs and cattle ranches along the highway, was the sight of pickup trucks carrying mattresses and furniture, entire lives, as young men head east and out of the prairies. As I walked into the empty dining room of Thai Woks N'go in Glendon, Alta., a Buddha-faced boy lay napping in a sunny spot across two dining chairs. At the sound of the door opening, he leaped up, eyes wide. "Customer!" he shouted. Lan Huynh, the boy's mother, said her restaurant used to be busy. Local oil workers were making $60 an hour (to her, an unimaginable sum) and a steady stream of customers would come in, ordering the "Chinese pierogis." Glendon has a large Ukranian population, and a sculpture across the street from the restaurant is labelled the "world's largest pierogi" – Lan serves a Chinese version, similar to regular Chinese dumplings, stuffed with meat and vegetables and deep-fried until crispy. She also serves Ukrainian ones, light and fluffy, with fried sausage, onions and sour cream. Now many workers have been laid off. The restaurant depends on the 480 people who live here year-round, most of them also feeling the oil shock. Even with business slowing down, Lan isn't convinced moving is the solution. She believes, as do many others I spoke with, that small towns are better places for raising children. Plus, she said, the restaurant industry in cities like Edmonton is too competitive and the cost of living too high. In Drumheller, Alta., Peter Li told me that business has dropped by about 30 per cent at Diana, his restaurant with red-vinyl booths and decorated with dragons hanging from the ceiling. In the same period, food costs have risen. "A case of broccoli is $90," he says. "Before, it was $30." Rising food prices are one reason why business is down at many chop suey restaurants in Canada. One of the most popular items at Diana is uniquely Chinese-Canadian: Ginger beef. The dish, first created in Calgary in the 1970s, was a loose interpretation of a northern Chinese beef dish with tangerine and chilis, but sweetened and mellowed to suit Western palates. Despite its name, it has almost no ginger in it. "The Alberta palate was so behind that they didn't recognize sweet chili sauce," explained Tzang, the museum curator. "They started asking for beef with 'that ginger stuff.'" Li is a trained chef who has worked in some of the biggest restaurants around Beijing, but when he first arrived in Drumheller he had to learn a new repertoire of chop-suey dishes: "Egg foo young," and "lemon chicken." Compared to the food Li trained to cook – delicate Cantonese dishes, or the fiery spice mix of mapo tofu – this food is much simpler to make. "For me, it's very easy," he said. He's tried a few times to cook here the way he'd cooked back home, but "the people here didn't really like it." Sitting at the front counter was a jar of Lao Gan Ma chili oil – often referred to as "angry lady sauce," owing to the stern expression of the woman on the label. Li looked longingly at the jar of sauce, made of dried red chilis and numbing peppercorns steeped in oil. Here, it was just for display. Li has just returned from a trip back to China, where many of his former colleagues have been promoted to prestigious kitchens. He sighed. "Before, I think Canada is pretty good, right? But it's hard to make money here," he said. 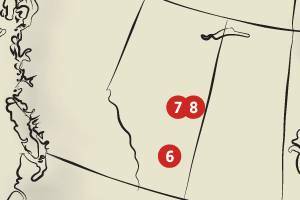 Alberta isn't the only province that's struggled from oil shock, and economic downturn. So too, has Newfoundland – where I was headed in search of Huang. Like the men in their pickup trucks, why hadn't Huang driven to another town, to the possibility of an easier life? 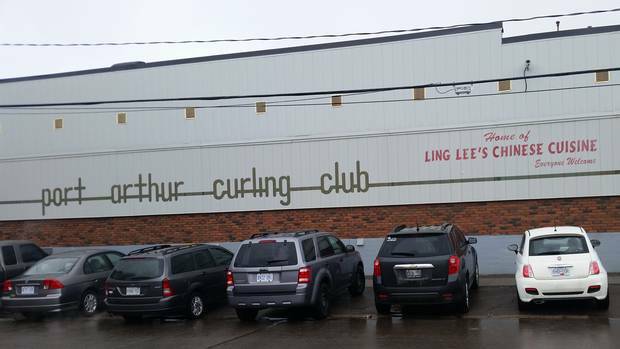 The Port Arthur Curling Club in Thunder Bay, Ont., is one of three in that city with a Chinese restaurant inside. Just a few minutes after 11 a.m. on a rainy Wednesday, the lights at the Port Arthur Curling Club in Thunder Bay turned on with a click. Two men dressed in fleece vests and pants shuffled onto the ice to line up their rocks. The day was just starting at the curling club, but in the second-floor area overlooking the rink, Norina Karschti and her staff had already been at work for hours. It was almost lunchtime at Ling Lee's Chinese Cuisine, her restaurant inside the club. In the kitchen, a cook grabbed fistfuls of cooked noodles from a plastic container and dropped them into a hot wok covered with oil. With a practised hand, he used a metal spatula to separate the noodles, pulling sections straight up into the air, ensuring every golden stranded was kissed by the hot wok. He added a few spoonfuls of MSG powder, then soy sauce. In the dining room, regular customers grew impatient as the clock ticked closer to opening time. They shuffled their feet. One, an elderly woman with a cane, sighed. If a Chinese restaurant inside a curling club seems unusual, it's not – at least in Thunder Bay. All three of the curling clubs in the city have Chinese restaurants. Ling Lee's was opened as an experiment in the early 1970s, the throwing together of two wildly different pursuits in a display of entrepreneurialism by the curling-club owners and the eponymous Lee. The idea took off. I arrived in Thunder Bay on the 10th day of a cross-country trip tracing the history of Canada's small-town Chinese restaurants: My planned last stop was Fogo Island, Nfld., where I hoped to meet Huang Feng Zhu, the owner of a place called Kwang Tung. And though Thunder Bay isn't quite a "small town," I knew I had to visit Ling Lee's after stumbling across it on Yelp, categorized as "Chinese, Ethnic Food, Skating Rinks." Many older customers in Thunder Bay still remember Ling Lee, Karschti's late father who founded the restaurant in 1973. Lee came to Canada in the 1950s as a teenager, following his father who arrived first and initially settled in Saskatoon. Like most of the men who wound up in Chinese restaurants, Lee did not have kitchen experience, but the work was one of his few options. So he improvised. He watched the other cooks around him, copying their quick movements. He saw how they conjured up memories of foods and flavours from back home and approximated them with what was available in this new place. Thus was born "chop suey," which translates loosely into "assorted bits and pieces." In other words, whatever is on hand. The consistent element of chop suey is bean sprouts. "It's the only thing [cooks] could reliably have wherever they were," said Linda Tzang, a curator at the Royal Alberta Museum. "You have a source of water, you have a bucket and you're growing bean sprouts." Tzang, who curated an exhibition on Chinese restaurants in the Prairies in 2013, says that many newcomers who ended up in remote towns didn't have access to the same ingredients reliably throughout the year. This explains the popularity of dishes such as fried rice, which could be thrown together with chicken, beef or whatever happened to be in the refrigerator. Instead of stir-frying or braising meats – as is common in Cantonese cuisine – cooks such as Lee dropped them into the deep-fryer. And whereas Cantonese food is distinct for its delicate flavours, the chop-suey chefs coated their dishes with cornstarch-heavy sauces that were often cloyingly sweet, sour or savoury – their own interpretation of "gravy," a Western concept. In Thunder Bay, and at Ling Lee's, the specialty is Bon Bon ribs: pork ribs dredged in five-spice powder and MSG, deep-fried to form a crispy brown crust then spritzed with lemon. A few years ago, food historian Ian Mosby traced the origin of Western aversion to monosodium glutamate, or MSG, to a letter to the New England Journal of Medicine in the mid-20th century. But many people continue to believe in Chinese restaurant syndrome, even though, as Mosby pointed out, many other foods containing MSG are not subject to the same criticism, including Doritos, Parmesan cheese and even baby food. In my trip across the country, I saw countless small-town Chinese restaurants with “No MSG” signs displayed in their windows, apparently essential to attracting business. Yet well-known chefs in big cities have signalled a change of heart on the subject. A few years ago, Momofuku owner David Chang gave a talk at the hugely influential MAD food symposium in defence of MSG. Danny Bowien, the popular chef behind Mission Chinese Food in San Francisco, places salt shakers filled with the stuff in his restaurants. And restaurateur Jen Agg of Black Hoof fame has spoken widely about the use of MSG in Rhum Corner, her Haitian restaurant and cocktail bar in Toronto. That's just one of many local specialties across the country and indeed, the continent. Tzang told me that in Peterborough, Ont., "deep-fried won tons" are just the skin, like a chip. Around Ottawa, "chow mein" – which literally means "fried noodles" – is sometimes just a plate of bean sprouts. And when I made it to Deer Lake, Nfld,. I would see an all-caps sign on the door of the Canton Restaurant, warnings tourists that the " chow mein on our menu is cabbage." 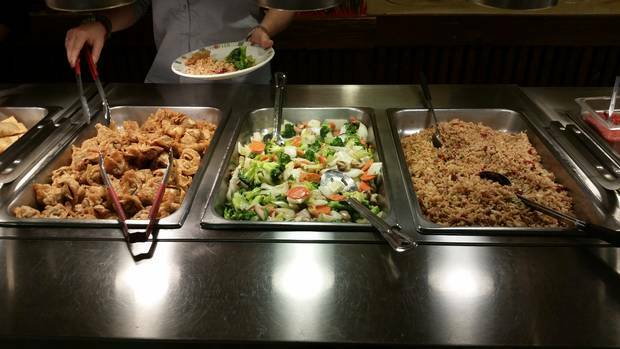 Owner Richard Yu explained that early Chinese cooks figured out how to thinly slice cabbage into "noodles." South of the border, Tzang said, American Chinese food also has local quirks. In New England, they serve chow mein sandwiches. In South Dakota, little pieces of chicken – such as McDonald's McNuggets – are deep-fried, then topped with a cashew sauce. In St. Louis, Mo., egg foo young is topped with pickle and tomato slices, and sandwiched between pieces of bread, then dubbed a "St. Paul sandwich." Of the dozens of Chinese-restaurant owners I would speak with across the country, Karschti was the only one to describe outright racism – of being called "Chink," and bullied in school. "When I look back at it now, I think, 'Oh geez, how did I survive that?'" she said. Yet her father's Thunder Bay restaurant became extremely popular and he began teaching cooking classes and even hosted a cooking show on a local cable-TV station. Karschti has run Ling Lee's on her own since Lee's death five years ago. When she was growing up, a few other Chinese kids in town also had parents who ran restaurants. Those kids have grown up and moved on; Karschti is the only one who stayed in the business. "I'm going to continue on," she said. "Keep going in his honour." At exactly 11:30 a.m., a waitress with short dark hair walked over to the buffet line, reaching under the sneeze guard to switch each of the lights on with a click. The buffet was open. But she didn't have to tell the customers. Some were already waiting, plates in hand. The fried macaroni Ann Hui ordered from Restaurant Lachute Holiday in Lachute, Que. From Thunder Bay, I made the long drive through Northern Ontario, past remote communities of rusty, abandoned trailers and shuttered motel buildings. The next day, I continued east into Quebec, to a town near Montreal called Lachute. 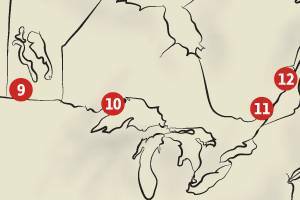 A few years ago, it came dead-last in a MoneySense magazine ranking of 200 Canadian towns in which to live, largely because of a lagging population and relatively low incomes. There, I met Zhang Guang Xiu, the owner of Restaurant Lachute Holiday, who had on his menu a dish I'd never come across before: "fried macaroni." "It's like stir-fried noodles, but macaroni," Zhang explained to me in Cantonese. He said the beef version was particularly popular, so I ordered it to go. As I waited for my food, Zhang explained how he wound up in Lachute. He came to Canada from Guangdong in 1990, and has spent all of his time here working in Chinese restaurants around Montreal, supporting his wife and three kids. It took him 26 years – until last year – to save up the hundreds of thousands of dollars to buy this restaurant. Within the first month, he knew it wouldn't be profitable. When Fred Wong left China in 1922 he was so poor he couldn’t afford shoes. By the time of his 1998 death, he left behind a small empire for his family: several gift shops, apartment buildings, and his flagship restaurant, Restaurant Wong in Old Quebec. But business hasn’t always been easy. In the 1990s, the popularity of “buffet” or “smorgasbord” Chinese restaurants came at the expense of a la carte restaurants like Mr. Wong’s. “People didn’t want to pay for food. They didn’t see the point in paying even $10 for a plate when they could have all-you-can-eat for $13,” said Steven Wong, Mr. Wong’s grandson who now runs the restaurant. Even these days, the younger Wong says, the restaurant struggles to find a balance between catering to tourists and the city’s dwindling Chinese population. By the third month, he put the place up for sale. "I wasn't able to pay myself," he said in a quiet voice. It's now been nine months, with no offers. Ideally, Zhang would like to go back to Guangdong, where the friends he grew up with are flourishing in the new Chinese economy. But his children are still in school. He'll have to wait at least 10 years before he can move back to China. As I began to walk toward the door, he left me with a parting warning: "Whatever you do, don't open a restaurant." He shook his head. "You can't make money opening a restaurant." 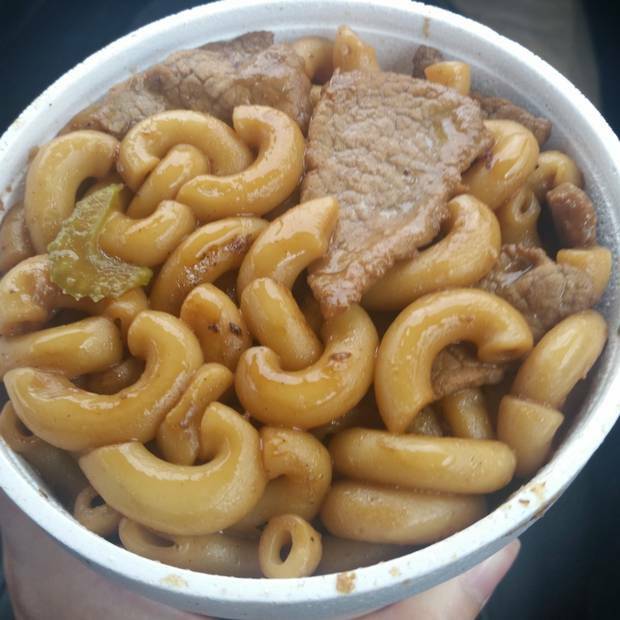 I got back into the car and opened the takeout container of fried macaroni. Unlike most of the other restaurants I'd visited so far, Zhang's had given me chopsticks, and not just a plastic fork. The pasta was overcooked. But the dish had wok hay, or "breath of the wok" – a prized, elusive quality, the mark of searing high heat and a well-seasoned wok. It tasted like the food of my childhood, of the pan-fried rice noodles with beef and onion my own mother would buy from Hon's restaurant in Vancouver's Chinatown or Penny on East Hastings. It was good, enjoyable in the same way that chop-suey cuisine is for those who grew up with chicken balls and sweet-and-sour pork. It was my favourite thing I'd eaten on the trip so far. 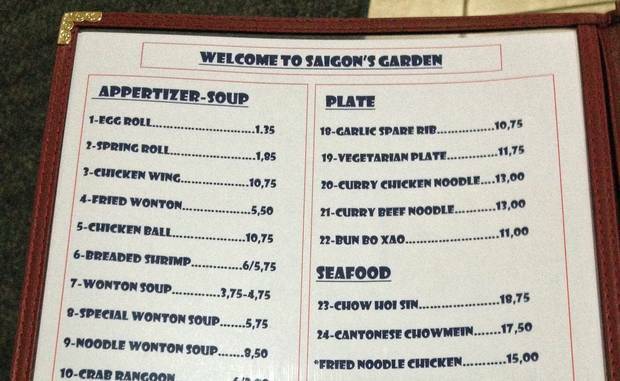 Saigon’s Garden, in Nackawic, N.B., is closed on Mondays so its owner can gather with fellow Chinese restaurant operators and learn more about the cuisine. 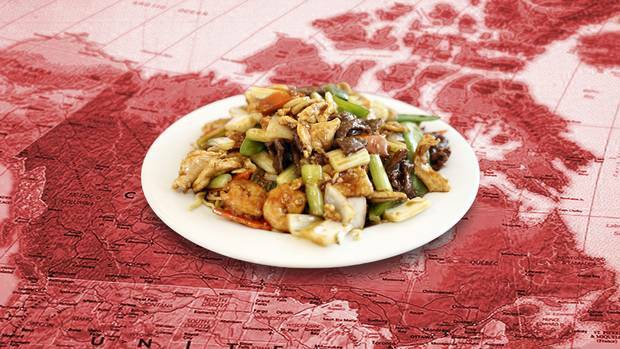 As I bounced along from British Columbia to central Canada, I'd gradually come to understand how, as chop-suey restaurants spread across this country, so too did the repertoire of dishes. As families migrated, opening new cafés across the country and continent, workers took with them the recipes they'd learned at previous jobs, which is partly why the standards of chop-suey Chinese remain so consistent across North America. Or, as I had seen in Boissevain, Man., recipes were bought and sold as part of the business. There, Li Su Fen of Choy's Restaurant had explained that when she and her husband bought the place, the previous owners spent a month teaching them the ins and outs – everything from how to fill out the bill slips to lessons on cooking every single item on the menu. Eventually, I arrived in picturesque Nackawic, N.B., a 1,000-person town set along the banks of the Saint John River, where 22-year-old Gen Le told me about his Monday-night meetings. Every Monday, Le explained, his restaurant Saigon's Garden is closed, so he spends the evening hanging out with a group of friends. But this isn't a group of any ordinary friends. These are the Chinese restaurant owners in most of the nearby New Brunswick towns – Woodstock, Florenceville and Saint-Quentin. At these gatherings, they unwind, trade stories and also teach each other how to cook. Like most of the Gold Mountain men who first started these restaurants, many of the owners (including Le's parents, who moved from Vietnam to Montreal in 1980) came to the Chinese-restaurant business not as trained cooks but as new immigrants needing jobs. So they used the meetings to learn the trade. For Le, these meetings are especially valuable, since he didn't even grow up around Chinese food. Le's family is ethnically Vietnamese – hence the restaurant's name. "Nobody knows what Vietnamese is," he said. Besides, he added, while sitting in the dining room of his restaurant, "this food isn't like, real Chinese food." He said this a little too loudly, causing customers at a nearby table to glance over. "It's what people like. So it's what we make." In 2006, his parents moved from Montreal to Nackawic to take over the restaurant from a friend. But as Le's parents have gotten older, they can no longer tolerate the gruelling work. So now, he runs Saigon's Garden with his older sister. He's also a full-time accounting student at nearby New Brunswick Community College. "My mom doesn't want me to be here forever," he said matter-of-factly. "But we need the restaurant to support them." As I neared the East Coast, getting closer to Fogo Island, I began to worry about the fact that I had not called in advance. It was the same approach I had used for most of the restaurants so far: It was easier to explain the purpose of my visit in person. But not calling ahead came with its own risks: What if Huang was off sick? What if I had come all this way just to find the restaurant closed? Little did I know I was about to face a more pressing problem: I had arrived on the Atlantic coast just in time for an April snowstorm. As soon as I crossed into Nova Scotia, it began to snow. 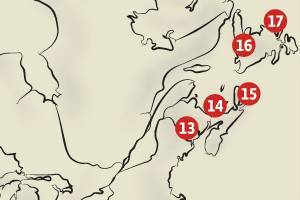 The drive to Cape Breton Island, which should have taken four hours, took eight. And by the time I arrived in Sydney that night, I learned that the ferry to Newfoundland had been delayed because of the storm. I'd now be on the overnight ferry. I began to worry that I might not reach Fogo after all. Even once I arrived in Gander, I realized, there was no guarantee the ferry to Fogo Island – known for frequent shutdowns – would run in this weather. I had planned this trip around Fogo Island, carefully designing a route that would leave Kwang Tung Restaurant as the final destination. I was still haunted by the photo of Huang, of the idea of this woman living alone on this remote island, and hated the idea of not being able to meet her. Sure enough, the ferry to Fogo was not operating the next day. I would have to fly as one of only three passengers in a 20-seat Twin Otter aircraft the provincial government had chartered as a replacement. For the short 20-minute flight, looking down on the frozen Newfoundland coast and the dark, gloomy Atlantic, this seemed like it might have been a fortuitous turn of events. But as soon as I landed at the Fogo airport – a generous description for a one-room, shipping-container-like building in the middle of what felt like frozen tundra – I realized I had a problem. Flying instead of taking the ferry had left me without a car. Nowhere in sight was there a bus, rental car or taxi to take me the roughly 10-minute drive to the community of Fogo. The one number I did have for a taxi service turned out to have been out of service since 2013. Everywhere around me were frozen fields and trees. Walking to the Fogo community would be a stupid idea. It was cold. I was stranded. I turned to the man standing behind me inside the one-room terminal. Did he know anyone I might be able to hire to drive me around for the day? He furrowed his brow, and thought for a second. Then he asked a small group behind him. Within seconds, a man's voice piped up. "You can take our car," said an older man with greying hair as he walked toward me, holding up his keys. His wife stood behind him. I was in disbelief. Was he serious? Could I pay him? Wasn't he afraid I would steal his car? He just laughed, and shook his head. "You wouldn't have anywhere to go with it," he said. The interior of Kwang Tung Restaurant in Fogo Island, Nfld. I drove up Route 333, past untouched snow and ponds frozen over into thick sheets of ice, into the tiny community of Fogo with its saltbox houses. Just like in the photograph, there was Kwang Tung, with its faded Pepsi sign. I pulled open the door to find a room filled with tables covered in red tablecloths and clear vinyl. It was quiet, devoid of customers, but as I walked further in, I could hear from the kitchen the sound of a wok hissing and a metal spatula clanging against steel. The dim kitchen was separated from the dining room with just a folding accordion door. Inside was a middle-aged woman with short black hair, dressed in a red sweater and a pink crocheted vest. It was Huang. With her back turned to me and the range hood roaring in the background, she worked to tame a mess of fried egg noodles in a wok, her gold earrings swaying as she wielded the spatula back and forth. I cleared my throat, and she turned around, surprised. When I spoke to her, initially in English, she looked confused, thumbing my business card in her palm nervously. But then I introduced myself in Cantonese and her face relaxed. Her Cantonese had an accent, which I recognized as coming from the Toisan county in Guangdong. Though she's lived in Canada 26 years, she said, she speaks only a little English – just enough to understand customers' orders. "They just say what they want to eat, I give them their food and then they leave," she said. She stirred a pot of red sauce on the stove as she spoke. Every so often, she wandered over to a table in the centre of the room, taking sips from a can of root beer. She grabbed some vegetables from the refrigerator, and threw them in the hot wok. She didn't come to Fogo alone, she said. Things just turned out this way. In 1990, she, her husband and two daughters came from Toisan to work at Kwang Tung for her brother-in-law. At first, they all lived here together. But then the chance came up to take over their very own restaurant, on the other side of the water in Twillingate. So they moved there. A few years after that, her brother-in-law was ready to give up Kwang Tung, so they decided to run both restaurants. By then, they'd had a third child, a son – their very own "Fogo boy," as they nicknamed him. Two restaurants meant two incomes, and a better future for these three children. So what if it meant living apart? She and the children moved to Fogo, and her husband stayed in Twillingate. For 15 years, they've lived like this, apart. "How many times each week do you see your husband?" I asked. Her eyes widened, and she laughed. "One week? You should ask me how many times I see him in one year. About 10." Visits mean closing one of the restaurants, which neither likes to do. "Now, the kids are grown up, and they've all left. It's just me who is left here now." The oldest daughter works in Halifax and recently gave birth to Huang's first grandchild. The second daughter is a physical therapist in Toronto and the youngest just finished university in St. John's. I asked if she was lonely and she gave it some thought. "Mmm, for someone like me, whose standards are not very high, the lifestyle here is quite steady," she said. Besides, she added, she doesn't like crowds. "Maybe the lifestyle here is right for my personality." She had two friends on the island, a couple. The man sometimes gave her rides to the store, or fixed things around the restaurant, while his girlfriend occasionally waited tables. As we spoke, the phone in the kitchen kept ringing. "Hello, restaurant," Huang would say into the receiver. Each time, she had a short conversation, then returned. The third or fourth time, she paused for a moment. We'd been speaking for well over an hour and she had something she wanted to share. "It's my 55th birthday today," she said, smiling shyly. That's why the phone kept ringing – relatives calling from abroad to wish her a happy birthday. I asked if she had plans to celebrate and she said no. I asked if there would be cake, and she just laughed, as if the thought never occurred to her. Like any other day, she said, she'd work. In 15 years, the restaurant has only been closed five times: Once when she was sick and the other times to visit her children. Otherwise, it's open 365 days a year. Like any other day, she'd close around midnight, prepare her own dinner, watch some television and go to bed. Her husband had planned to visit for her birthday, but couldn't when the weather meant a cancelled ferry. She did have a free-range chicken that he had brought on a previous visit. She'd been saving it in her freezer for a month now, but perhaps she would have it that night. A treat. Huang knows that others might look at her sacrifices, and her simple life, as unusual. "Am I crazy?" she asked, then laughed. But she can't imagine any other way. As she spoke, she gestured with her hands – hardened from years of cooking, callused so that her children's wouldn't have to be. Now that their kids are grown, she and her husband are starting to plan for their future. There's talk of him moving back to Fogo, or even the two of them away from Newfoundland, closer to their kids. "They don't like me being here by myself," she said. "They say I'm getting older, and if anything happens, nobody will know." Huang led me to the apartment behind the kitchen. The living room where the family used to gather is now filled with storage from the restaurant – spare light bulbs and stacks of Styrofoam takeout containers. She wanted to show me photos of the kids: one daughter's graduation photo, the other smiling in a dress at a formal. There were no photos of herself or her husband. As she held up her children's photos, pointing proudly at their smiling faces, she could have been any of the restaurant owners I had met, any of the families who had shared their stories on my 18-day journey. Near the beginning of my trip, University of British Columbia professor Henry Yu had told me this would be the case. "It's all about the families," he said. He had been right. I had come all this way to meet Huang, wanting to hear the story behind this mysterious restaurant on this mysterious island. I had come to Fogo knowing she lived alone, in the most isolated way I could possibly imagine. I had expected to hear tales of unimaginable loneliness. But as she spoke about her son's graduation, her daughters' accomplishments and her visit to see her grandchild, she lit up. She was smiling, tilting her head back and laughing. Her heart was full, and she was happy. She was the happiest woman I had ever seen.